Thread: Ridgid, movable, adjustable, steel strongback frame, anybody? I only have so much room and have realized that despite living in great weather, I 2ont be building boats outside and do I should limit things to the 8 to 13ft range. I am considering having a rolling steel frame made about 3 or 4 feet wide by 7 or 8 feet long. If I lay down "ladder rails" on top of it, made out of unit strut channel, I could easily bolt to that wood 2x2 "ladder rungs" at intervals required by the plans and then attach the frame cross beams to these rungs. By switching between lengths of rail, I could build various length skiffs. I was thinking that each corner could be set to lift independently so the frame could be leveled at any location I wheel it too. If it has a shelf on the bottom, sand bags or buckets could increase its mass to steady it if needed. A bolted on top of 3/4 ply would then be a low table to place a work piece on for working on it (like a flipped hull or cabinet. Re: Ridgid, movable, adjustable, steel strongback frame, anybody? ( Disclaimer : my thoughts only ) - to expand on what Wiz said - take a look at trailers with a removable / folding tongue, that will minimize the space taken up when not actually being moved. I built the low 2'x12' bench/table seen here about 10 years ago for my first build. It has since been the base for three more boats (from 6'8" to 15') a bunch of spars and oars for the boats. Very handy and small enough that I can just move it out of the way. I think Unistrut is great stuff, just a bit heavy and expensive for what you described. How do you level and secure it? I am working in a garage and the floor is neither flat nor level. All of that steel seems needlessly expensive, heavy and awkward to store. I always build on a wooden ladder frame. For smaller hulls the stiles are leveled with shingle as shims and squared and screwed onto sawhorses which are screwed to the 3/4 plywood floor. For a larger hull the stiles are screwed to the floor itself. You could just shoot down some blocks on your concrete garage floor and fasten horses or stiles to them. 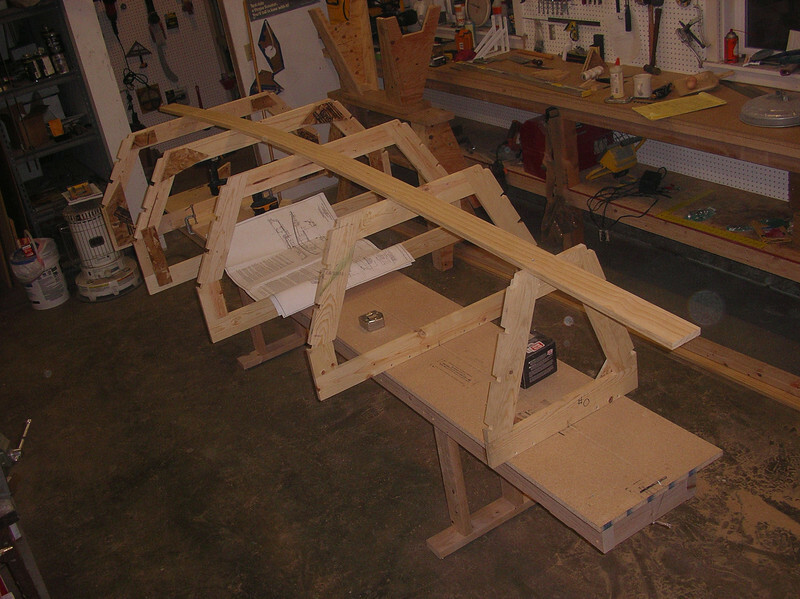 Once the hull is flipped the ladder frames are disassembled and the lumber easily stored or used for something else. Something a lot like this. Long threaded section and I added a nut so I could lock the foot in place once level. I have a few sandbags to weight the table down, they keep things in place really well, but I find I rarely apply much brute force while building. That path just leads to breakage. Unfortunately I am in a concrete floored garage and just dint have that room. Sonits smaller boats and no nailing to the floor. Wouldn't have to store it as it would simply always be in use. I've built all my boats on a wood ladder frame on locking casters. My floor is flat and level, but shims under the casters would take care of any problems. Just roll the boat to where you want it and relevel.